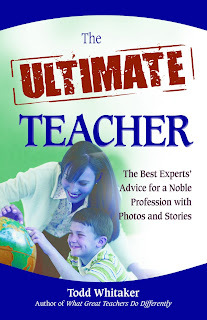 I contributed a story to an anthology called The Ultimate Teacher, which is due to be published May 1, 2009, just in time for National Teacher Appreciation Day in the US, on May 5. My story, Spelling Lesson, is about the lengths I went to once as a young teacher to make learning fun for my students, and how that backfired on me. It's great for me as both a writer and a teacher to see another of my stories in shiny new print! But it made me think about teaching in general. Some of the best teachers in my life have certainly not had the title "teacher". Many have been friends, or experts I've sought out to find the answer to a problem I'm having. They've come from various backgrounds, ages, cultures. What do they have in common? The teachers I admire have been those who are generous in sharing their knowledge and passion. They have been warm, wonderful people with a knack for communicating. They've shown their core beliefs in everything they said and did, and they've encouraged me to believe I have the ability to learn from them. I very much appreciate the great teachers in my life. From the school teacher who introduced my eleven-year-old self to poetry and classical music, to the cyber friends who help me out with the mysteries of blogging, they have been and are very important to me. Thank you all. I don't think we need a special day or week to remember people who are important in our lives. However, I do think we need to remember to thank them. Which teachers have influenced you?